Due to the flooding and road closure in April 2018, Hanalei Day Spa at the Hanalei Colony Resort is currently not receiving guests. Fortunately, there was no damage to our buildings, and there were no fatalities. A tentative reopening for the road is planned for Late Spring 2019. Thank you for your understanding and patience during this process. Please note, we have no staff on site. We look forward to welcoming you to our special paradise as soon as possible! Click here to receive updates! A hearty warm aloha to you from our staff at Hanalei Day Spa on Kauai! We have been serving visitors and the community since 2003. We invite you to step into our boutique day spa, feel the warm aloha of the island and our welcoming staff. Experience the soothing hands of Kauai’s best massage therapists, the delicious ocean breezes and pristine clean air. We start with our basic massage, which is a relaxing massage, then we custom tailor your experience from there to include accompaniments such as beachside, deep tissue, and aromatherapy, to name a few of our most popular. Our guests love receiving in spa and beachside singles and couple’s massage, and Hawaiian style Lomi Lomi. Deep tissue and hot stone massage really works out the knots! As relaxation specialists, our job is to help you find the best services for your needs. We have lots of services that make your honeymoon, anniversary or vacation relaxing, recharging and rejuvenating, which is one of the many reasons why couples love Hanalei Day Spa! Whether you would like to receive a 50, 80 or 110-minute service, we can make your experience great. Our couples come back year after year and find consistent excellent service…. We love couples, in fact, 95% of our guests are couples. Our traditional thatched roof ‘Lomi Hale’ (Hawaiian for massage house) is the only authentic Lomi Hale on Kauai. Built just like the ancient Hawaiian houses, just off the sand so it remains unaffected by large surf. Our guests enjoy beachside massage in a private area of the resort. It is enclosed on 3 sides and open to the ocean side (makai). We protect your modesty at all times and the massage therapists will step out as you lay face down on the massage table. We offer beachside massage weather permitting. If it is blustery, cold or rainy we see guests in spa as the alternative. We can see up to 3 friends beachside. Extraordinary! My husband and I enjoyed a 1½ hour deep tissue couples massage near the beach this afternoon. 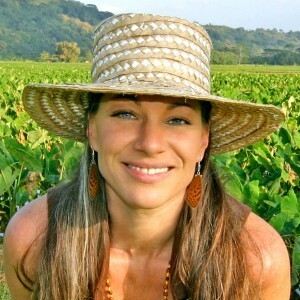 The service, ambiance, genuine care and concern and professionalism at Hanalei Day Spa are beyond compare! Our masseuses, Chris and Suzan were amazing. We left feeling so relaxed, refreshed, and rejuvenated! Our experience was perfectly perfect from start to finish, and Joelyn at the front desk was terrific too. Take the time to drive down the road and enjoy the best massage of your life! We will make this a tradition each time we visit beautiful Hanalei! I wanted a massage out in nature and this place delivered. My husband and I got a couples Lomi Lomi massage on the beach. I liked the thatch roof where they had the massages and it was more spacious than the pictures made it look. Cozy, private and a beautiful view. I could hear the ocean waves in the background and smell the scent of coconut. We are so happy we drove by the Hanalei Day Spa and saw their sign. The outdoor Lomi Lomi massages were amazing, and made even more spectacular by hearing the ocean waves crashing just outside our hut. Our massage therapists knew their trade, and I would highly recommend this spa to anyone who visits Kauai. Located in paradise, where the ocean, heaven, and healing meet, on the beautiful property of the 5-acre beachfront Hanalei Colony Resort. This boutique day spa is a hidden treasure on the North Shore of Kauai. Nestled in between Haena Beach and the Bali Hai Mountains you’ll find the Hanalei Day Spa. 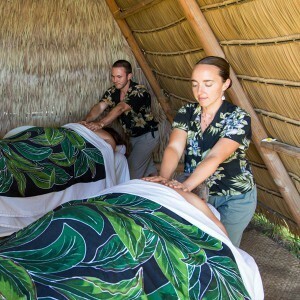 Add to the magic of your Kauai experience by joining us for a peaceful beachside massage in an authentic thatched Hale with warm ocean breezes relaxing you into tranquility. You’ll love visiting our unique location and cherish the individual attention and quality of service you’ll receive when you are here. Our massage therapists take the time to focus on your individual needs. Choose from a wide variety of therapies to enhance your massage; indulge yourself with a beachside massage, deep tissue massage, lomilomi massage or the addition of hot stones. Share your experience with a loved one, side by side in our couples room or beachside Hale where the sound of the waves will soothe your soul. At our boutique day spa, you will be welcomed by experienced, trained, professional massage therapists and friendly receptionists who have a strong commitment to excellent customer service. Each member of our Ohana is hand-picked for their skill, experience and communication skills. Let our caring and skilled professionals guide you every step of the way, allowing you to relax, recharge and rejuvenate. Radiant health awaits you at the Hanalei Day Spa.